Cauvery Handicrafts is a treasure for locals and tourists. They have a variety of products and curios that are not only good for your own household but perfect for gifting too. 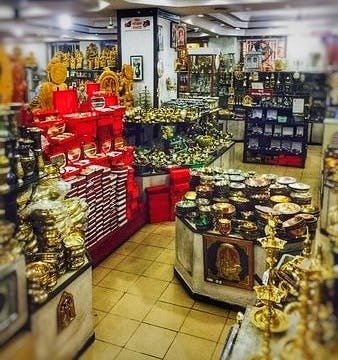 They carry beautiful handcrafted rosewood and sandalwood products, incense sticks, perfume oils, metal handicrafts which consists of brass and copper products like diyas, bowls, plates, urli etc. They also have a huge collection of bronze idols that are absolutely gorgeous! And that's not all, you'll also find paintings and a whole lot of lacquer ware toys and bangles. The price range starts at around INR 50 and goes up in lakhs depending on what you buy. The huge handcrafted sandalwood idols and artefacts are the ones priced in lakhs. This store is literally a shopping haven and you'll certainly find something that you won't be able to resist buying.